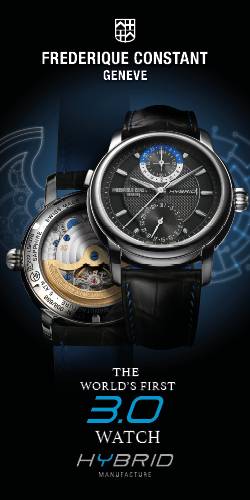 Even if the name of GRIEB & BENZINGER’s new collection Shades of Grey reminds some people of E. L. James’ successful trilogy—and they do have a cool, secretive fascination in common—the new white gold watches by GRIEB & BENZINGER tell their very own stories. As so often the case with this company, these two new creations from the masters of skeleton watches are the direct result of wishes from some of our customers, who are located all over the world. The GREY POLARIS , housed in discreet white gold with grey-colored visible movement components, was created at the behest of a technology-obsessed architect from Asia. The base dial, guilloché and semi-skeletonized by hand, was coated with black rhodium for this edition, while the applied, skeletonized dial was coated with a lighter-colored rhodium, which changes among various shades of grey depending upon the light. The GREY TULIP fulfills the wish of an Eastern European client who had already become enamored of the successful BLACK TULIP. In the end, he desired an almost identical, less ostentatious version that does not reveal its true value at first glance so that he can wear “his” new skeleton watch anytime, anywhere. The GREY TULIP IMPERIAL including the finest Princess-cut diamonds set into the bezel and the GREY TULIP Diamond set with high-grade brilliant-cut diamonds on the bezel and lugs fulfilled the dream of a client in the Middle East, who was also fascinated by the successful BLACK TULIP but prefers cool white gold. Thanks to his weakness for high-grade diamonds, a special bezel containing the finest Top Wesselton Princess-cut diamonds was created as well as a second version with the finest Top Wesselton brilliant-cut diamonds on the bezel and lugs. Fully skeletonized watch with floral pattern – elegant, exceptional. Movement fully skeletonized, guilloché and engraved by hand. Solid 750/000 18-karat palladium-white gold case 43 mm in diameter and grey alligator-skin strap with 750/000 18-karat palladium-white gold buckle. Fully skeletonized watch with floral pattern – elegant, exceptional. Movement fully skeletonized, guilloché and engraved by hand. Solid 750/000 18-karat palladium-white gold case 43 mm in diameter with finest Princess-cut diamonds and grey alligator-skin strap with 750/000 18-karat palladium-white gold buckle. Fully skeletonized watch with floral pattern – elegant, exceptional. Movement fully skeletonized, guilloché and engraved by hand. Solid 750/000 18-karat palladium-white gold case 43 mm in diameter. Bezel and lugs set with 77 of the finest brilliant-cut diamonds, grey alligator-skin strap with 750/000 18-karat palladium-white gold buckle.